Availability: The government will roll out 100,000 units of the Aakash tablet initially. The details of the availability of the device are bit sketchy. The government says it will distribute the device to students through the institutions they are studying. So, best way to find out exact availability of Aakash tablet is to contact your concerned department of your college/institution. Commercially, the device will be launched in November. Pre-booking for the Aakash tablet (retail version is known as UbiSlate) has already started. For more info on pre-booking click here. Price: Well, the Aakash tablet will be available for students at a subsidised price of nearly Rs. 1,730. However, the exact price of the Aakash is nearly Rs. 2,276, which the government paid for its procurement. As per the official website, the Aakash tablet a.k.a UbiSlate will be commercially available at Rs. 2,999. Plans: As per official website, UbiSlate will come with an unlimited mobile Internet at Rs.98/month. Specs: The Aakash tablet comes with a seven-inch 800x400 resistive touchscreen. It runs on Android 2.2 Froyo OS and is powered by 366 MHz + HD video co-processor. For connectivity, it has an inbuilt WiFI support and can connect a datacard for 3G and GPRS connectivity. The device comes with a 2GB of storage memory, which can be extended up to 32GB via microSD. It has a 256 MB RAM. The device supports document formats: DOC, DOCX, PPT, PPTX, XLS, XLSX, ODT, ODP and can run PDF viewer, Text editor. It has a 2,100 mAh battery which is promised to give 3 hours of backup depending upon usage.Check out more spec details here. Versions: Yes, there are two versions of the Aakash tablet. The subsidised Aakash tablet will miss few features such as inbuilt cellular modem and SIM to access Internet. The retail version is likely to sport full-fledged specs as announced by the government. Is Aakash really world’s cheapest tablet? Media seems to love tagging India as the “cheapest market”, especially after the launch of Tata Nano. However, it’s not same for the Aakash. After some search on Internet, we found out that there are a number of tablets available in the same price range and that too with better specs. We already have a seven-inch tablet running Android 2.2 OS with an 800 MHZ Cortex-A8 processor, 256 MB RAM and 2GB hard drive, built-in camera at a price of $ 39.71. Check out the product here. And if you slightly go up, you have Maxtouuch 7inch Tablet PC. Similarly, there a number of Chinese companies offering tablets running various Android versions with better processors between the price range of $40-50. The Aakash tablet offers nothing extraordinary other than its ultra low price. If it is overhauled on the specs front with a slight price hike, the Aakash could catch up with other high end but affordable tablets in the market. So, if the retail price for a single unit from an Indian retailer for a more powerful tablet is Rs 5,000 ($100). We are almost sure that the same tablet can be ordered in bulk to get the pricing down to the range of $50. The point is, perhaps the specifications and technology for the Aakash tablet could have been better, especially when you count the exemptions of duty and other benefits that would have been applied to the $35 project. Going by the specifications and the fact that the tablet with run Android 2.2, it's performance might just be below acceptable levels. 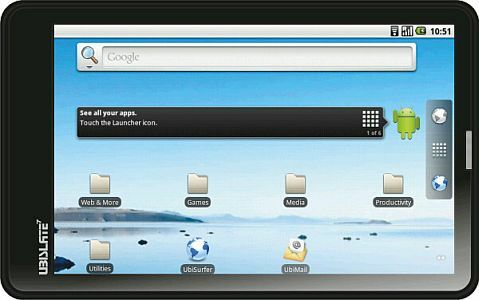 Unless the Google Android 2.2 OS on the Aakash tablet is heavily modified for performance boost on slower processors, the lag and response of the tablet with a resistive screen can result in a frustrating experience. We hope to get our hands on the $35 gadget soon, we will reserve our final verdict for the detailed review.